Colourpop are a cruelty free brand from the US and their product line includes eyeshadows, highlighters, lip pencils and liquid lipsticks. I've heard all round good reviews about most of their products, but it is their liquid lipsticks that I'm most interested in at the moment. If you remember my Colourpop Lipstick Swatch post from a few weeks ago, you will remember that I promised to bring you a post and video on my exact thoughts of the product and formula. Now that I've had over a month to test out these bad boys, I can finally bring you the results of my rigorous testing! Colourpop have two formulas, an ultra-matte and a satin finish. I have been testing a mix of both formulas and have found that the ones with the satin finish are much more comfortable to wear on the lips throughout the day as they feel far more moisturising than their ultra-matte counter parts. That's not to say the ultra-matte formula is bad, but just not as comfortable to wear and I find it can get to that point in the day where it no longer feels nice on my lips. I don't recommend wearing a balm or gloss over the top as it makes the lipstick transfer and renders the non-transfer formula useless! They also wear on the lips quite nicely. I have found that if I am wearing a shade close to my own natural lip colour, I hardly notice it wearing away after eating and drinking. Of course, brighter and deeper shades will be far more noticeable as they wear, but that's expected. For a full in depth review, including shipping, shades, formula and the best way to wear these liquid lipsticks, please check out the video below! 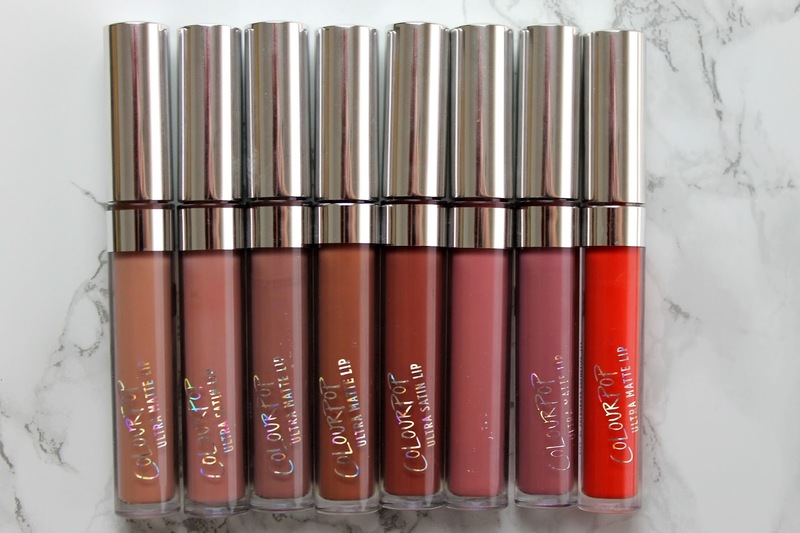 I have really tried to cover all relevant topics but if you have any other questions about Colourpop or any of the shades please let me know in the comments down below! They are just amazing, I can't wait to buy and try out some more of their products! I haven't actually heard of this line but I love that they're cruelty free! I will definitely have to track some down! Definitely go for it Kasie, I think you'll love them! I've been loving liquid lipsticks and these look so good. I love the matte finish and the color range of these. They are absolutely gorgeous Lily! Hopefully you get to try these soon. Colour pop is my favorite brand. Amazing lip glosses. You definitely should Sarah, these lipsticks are great! Wow, too many choices and products! Great video! Thank you so much Yuliya! I don't think they ship to the UK yet, but if you're familiar with using forwarding shipping services you could definitely try and order some products that way! I love the Ultra Satin formula the best, but the Ultra Matte formula wasn't as bad as I thought it would be.